The biggest process on that machine was always Ngen.exe and everything was very slow. This tells me that NGen did not recover from time to time from its high memory consumption but that it did allocate like crazy until the machine had no physical memory anymore. When an application uses all memory the OS will page out all memory to the hard disk when no physical memory is left. After writing many GB of data to the hard disk NGen can continue to allocate more memory until no physical memory is left and the OS will write all memory to the page file again. 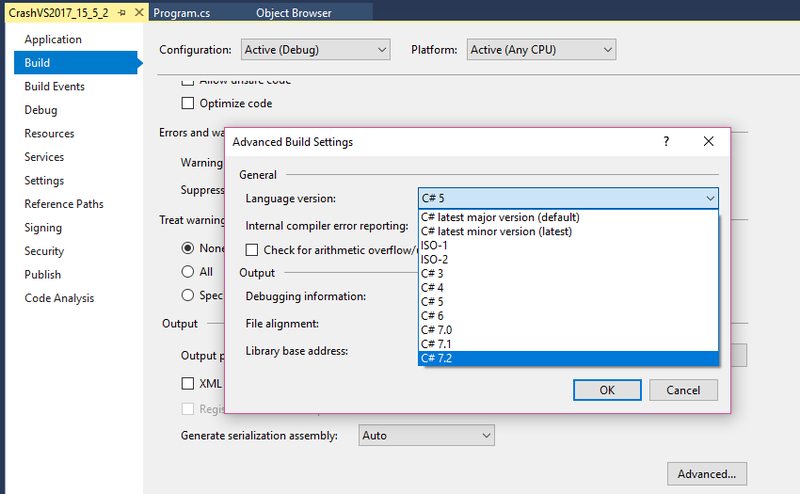 This will continue until Ngen.exe finally hits the commit limit which is the sum of Physical Memory + Page File Size which results in an Out Of Memory error. Only then the process will terminate. When NGen did go crazy like this MS support suggested to delete the registry key Computer\HKEY_LOCAL_MACHINE\SOFTWARE\Microsoft\.NETFramework\v2.0.50727\NGenService\Roots and its decendants. That fixed the issue but it remained mysterious why this was happening and what exactly did break. 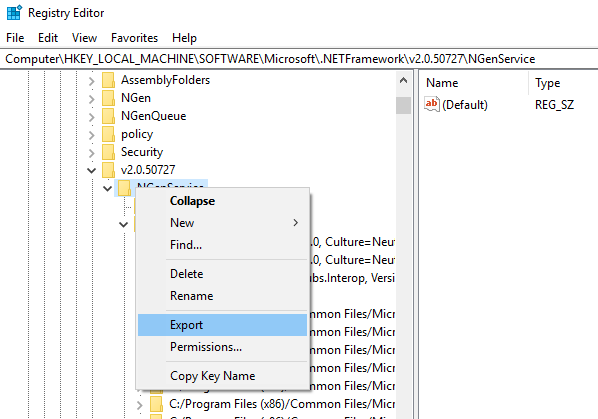 When you delete the registry key NGen will build up its Ngen root dll cache automatically. Inside the registry keys was no obvious garbage data visible and the issue remained mysterious. But finally I have got my hands on a machine where the issue was still present which allowed me to take more evidence data. What data should we get? Part of it is based on experience and the other part is more psychological. If you hand over a bug report to someone else you should anticipate that he/she is not familiar with your favorite debugging tool (e.g. Windbg). Filing a bug report with random findings is easy. Filing a bug report which enables the support personnel to get down to the real root cause is much harder. When I have a nice reproducible bug which I can repeat easily as often as I want I tend to get all data I can get. When file/registry issues are involved I would get some or all of the things below. 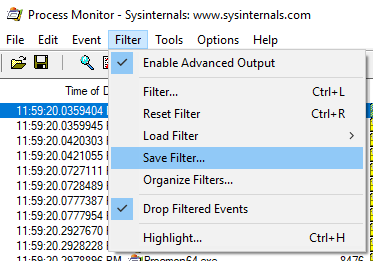 Procmon is a SysInternals Utility which can record all process starts along with all file and registry accesses. When you start it you can add a filter for the process of interest. In our case it is ngen.exe. That is important if you need to wait for an incident to run for hours. You should always get the latest version of procmon since from time to time some memory leaks or other things are fixed which could hinder a successful data collection. The gathered data can then be saved as PML file which can be read into the tool again on a different machine. To save the data you can choose a nice file name which describes the problem. Naming is hard but be precise what the trace actually contains. In a few weeks even you do not know what that file was for. In our NGen case we find that NGen deserialized the native image roots from a registry list. That is a very powerful capability but you need to set the symbol server and the path to dbghelp.dll from a Windbg installation (x64 usually) to get valid call stacks. There is one caveat: Procmon cannot decode stack traces from managed code which makes this otherwise great tool severely limited mainly for unmanaged stack trace analysis. Who said that data collection is difficult? When we look at the NGen registry keys which were accessed we find a large list of all NGenned dlls “cached” in the registry. This is done for performance reasons. The .NET Framework had always a soft spot for the Registry. NGen does it and the GAC also. That is much faster to read than to traverse over 4000 directories only for the 64 bit NGenned dlls. Since the corruption is data dependent we can simply export the whole NGenService tree into a text file which can hopefully help to diagnose the data corruption. The resulting text file was over 200 MB in size. It is unlikely that you will find the root cause by looking at a 200 MB text file line by line. We need more clues where we need to look at. Pattern identification is a very important skill you need to develop if you want to analyze an issue. One if not the most powerful analysis method is differential analysis. Usually you have a good case and a bad case which you can compare and see where the behavior starts to diverge. But it also works in the other way to find common patterns. The presence or the absence of a deviation can both be a useful hint. It is a good idea to capture the data not only once but several times to be able to find stable patterns in the data. Hm. Not sure if that is the problem. Lets get more data. 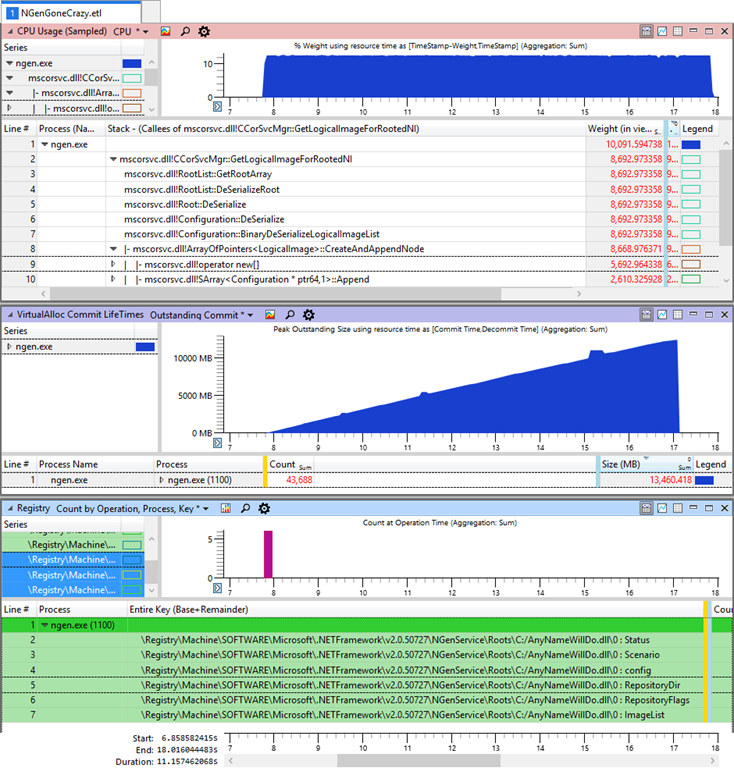 There are many ways to capture memory dumps but the most flexible tool besides DebugDiag is procdump. It is a simple command line tool which can trigger the creation of a memory dump in very sophisticated ways. In our case it is straightforward. We want to start NGen and then take 3 dumps with 1s in between because the memory leaks is growing very fast. [23:16:42] Dump 1 writing: Estimated dump file size is 1418 MB. [23:16:47] Dump 2 writing: Estimated dump file size is 4144 MB. The command line parts are -s 1 to wait one second between each dump, -n 3 to take three dumps before it exits, -ma to take a full memory dump, -x expects as first argument the dump folder and all other arguments are the executable and its command line arguments. If you look at the command line parameters you will find a lot more. The output a little frightening at first but there is a secret switch (procdump -? -e) which will print a lot of useful examples how procdump is meant to be used. Actually this switch is not secret but nearly no one will read the large command line help until the end which is the reason I spell it out explicitly. That information should be sufficient for any support guy to drill down to the root cause. To make sense of the call stack you need local variables which are not part of the public symbols of MS. For us outsiders that is as far as we can analyze the problem. Really? Lets have a look at the method names. NGen deserializes a Root Array of native image roots from the registry. While it is deserializing a specific root object it deserializes something with a method BinaryDeSerializeLogicalImageList. That sounds familiar to the binary registry node ImageList from our registry dump. When we only could know the registry key it was just deserializing. This involves a little bit poking the in the dark. I would expect that the stack between DeSerialize and BinaryDeSerializeLogicalImageList contains hopefully somewhere the registry key name. 000000c9`5f2fe710  18 e7 2f 5f c9 00 00 00-43 00 3a 00 2f 00 41 00  ../_....C.:./.A. 000000c9`5f2fe720  6e 00 79 00 4e 00 61 00-6d 00 65 00 57 00 69 00  n.y.N.a.m.e.W.i. 000000c9`5f2fe730  6c 00 6c 00 44 00 6f 00-2e 00 64 00 6c 00 6c 00  l.l.D.o...d.l.l. 000000c9`5f2fe740  00 00 74 00 75 00 62 00-73 00 2e 00 49 00 6e 00  ..t.u.b.s...I.n. 000000c9`5f2fe750  74 00 65 00 72 00 6f 00-70 00 2c 00 20 00 56 00  t.e.r.o.p.,. .V. 000000c9`5f2fe760  65 00 72 00 73 00 69 00-6f 00 6e 00 3d 00 31 00  e.r.s.i.o.n.=.1. 000000c9`5f2fe770  30 00 2e 00 30 00 2e 00-30 00 2e 00 30 00 2c 00  0...0...0...0.,. 000000c9`5f2fe780  20 00 43 00 75 00 6c 00-74 00 75 00 72 00 65 00   .C.u.l.t.u.r.e. 000000c9`5f2fe790  3d 00 4e 00 65 00 75 00-74 00 72 00 61 00 6c 00  =.N.e.u.t.r.a.l. 000000c9`5f2fe7a0  2c 00 20 00 50 00 75 00-62 00 6c 00 69 00 63 00  ,. .P.u.b.l.i.c. 000000c9`5f2fe7b0  4b 00 65 00 79 00 54 00-6f 00 6b 00 65 00 6e 00  K.e.y.T.o.k.e.n. 000000c9`5f2fe7c0  3d 00 33 00 31 00 62 00-66 00 33 00 38 00 35 00  =.3.1.b.f.3.8.5. 000000c9`5f2fe7d0  36 00 61 00 64 00 33 00-36 00 34 00 65 00 33 00  6.a.d.3.6.4.e.3. 000000c9`5f2fe7e0  35 00 2c 00 20 00 70 00-72 00 6f 00 63 00 65 00  5.,. .p.r.o.c.e. 000000c9`5f2fe7f0  73 00 73 00 6f 00 72 00-41 00 72 00 63 00 68 00  s.s.o.r.A.r.c.h. 000000c9`5f2fe800  69 00 74 00 65 00 63 00-74 00 75 00 72 00 65 00  i.t.e.c.t.u.r.e. It looks like the ImageList of this dll is corrupted which did cause NGen to go into an infinite loop. A deeper look at the surrounding registry keys from the registry export revealed that another registry key of the previous dll was also corrupted. This is really strange and I have no idea how NGen could manage to corrupt two unrelated registry keys RuntimeVersion (string) and ImageList (binary). Based on our previous investigations we should get data about memory allocation, CPU consumption and accessed registry keys which should give us a good understanding how the problem evolves over time. 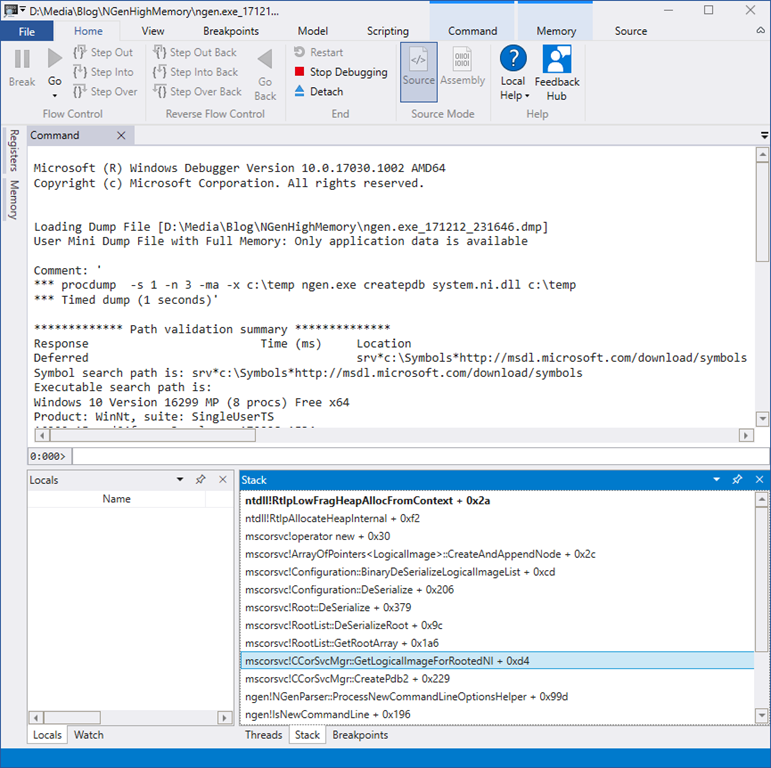 To capture ETW data you need normally to download and install the Windows Performance Toolkit which is part of the Windows SDK. But since Windows 10 the command line only tool named wpr.exe is part of Windows itself. That can be important if you are working on a machine which is locked down with e.g. Device Guard and you cannot install new software easily and you cannot execute not Authenticode signed binaries which rules many home grown data collection tools out. Normally I use ETWController (http://etwcontroler.codeplex.com/) which enables me to capture mouse and keyboard interactions along with screenshots which has proven to be invaluable many times. But on a locked down machine one needs to use the tools which you can start. We find that practically all CPU is spent in allocating memory while the method BinaryDeSerializeLogicalImageList was executed. The VirtualAlloc graph shows a frightening allocation rate of 1,4 GB/s which is the most massive memory leak I have seen since a long time. 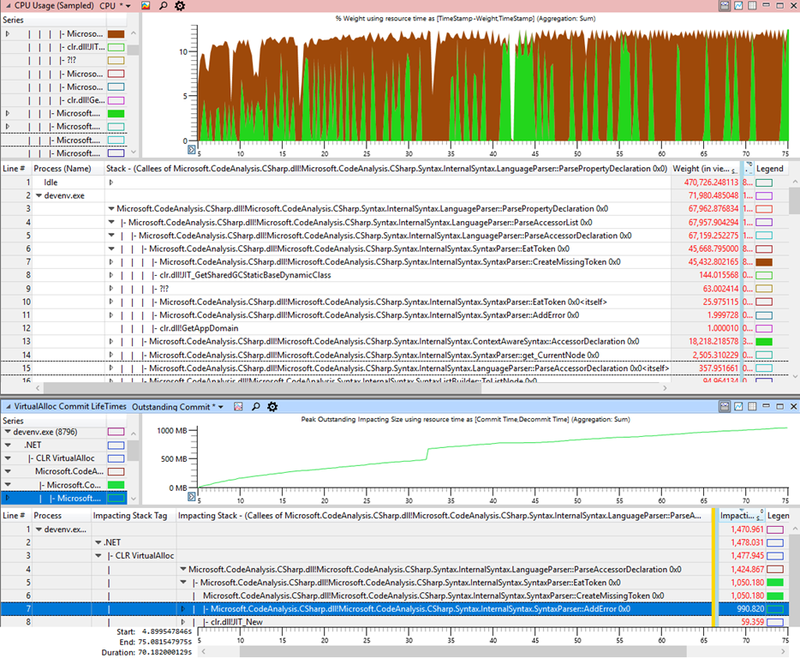 The last graph shows that the huge allocation rate starts once the ImageList of the dll C:/AnyNameWillDo.dll was read. After that no more registry keys were read which is strong indicator that this registry key is the one knocking NGen out. in the directory where the native image of System.ni.dll is located NGen will explode. But beware that at least on Windows 10 my machine did freeze and never recover when all physical memory was allocated. It seems that older Windows editions (e.g. Server 2008 R2) deal with such rapidly allocating applications in a better way which lets you at least terminate the application once it has gotten all physical memory. After have drilled down that far it is pretty clear where NGen did break although it remains a mystery how the registry keys were corrupted. The case is currently being investigated at Microsoft which will hopefully result in a more robust NGen which will ignore bogus registry entries and delete them which should cause the recreation of the missing NGen root entries some time later. The data sent to MS are memory dumps, and ETL Trace, procmon trace and the reg file to corrupt the registry on a test machine. Troubleshooting is not magic although many people assume magic happening here. It is pretty straightforward to capture the relevant data with some experience. Analyzing the captured data is indeed a complex undertaking and requires a lot of experience. The goal of this blog post is to help other people dealing with failures to understand what data is needed and why. Capturing the data is much easier and faster than to analyze it. If you capture the right data you will make the work of others trying to help you a lot easier. I always tell people that it makes no sense to assign one guy of a team as troubleshooter and send him to a Windbg/ETW training. First of all if someone is assigned to a task he dislikes he will never be good at it. Second it needs a lot of practice and experience to be able to drill down this deep. If you are trying to analyze such an issue once every few months you will not have the necessary skills to use the tools correctly. If you want to bring a member of your team at a good level to troubleshoot hard issues he/she must be willing to look at a memory dump nearly every day. If no one raises his hand for this task you can spare the money for the Windbg/ETW training. But it makes sense to bring all team members to a level where everyone understands what data is needed to let some specialized guys to look into the issues in an efficient manner by providing enough and the right data to successfully nail the root cause. As a positive side effect more people will get used to these tools and some guys will like to drill deeper. These are the ones you should send to a Windbg/ETW training. That’s all for today. Remember: Great tools are useless. Tools become great when people use them.